With clients increasingly looking at cost optimisation by passing on the risks to the IT vendors and IT services players demanding longer tenure deals to hedge their risks, a mix of these two factors are giving rise to large deals coming up in the market with a lot of strings attached. The contours of large deals bagged by Indian IT services majors are changing fast. Most of these deals come with riders where service providers must do a lot of rebadging of employees and invest upfront for clinching these multi-year contracts. Analysts are of the opinion that clients are increasingly looking at cost optimisation by passing on the risks to the IT vendors. This is one of the prime reasons behind such conditions being attached to the contract. IT services players are demanding longer tenure deals to hedge their risks. So, the mix of these two factors are giving rise to large deals coming up in the market with a lot of strings attached. "If you look at the large deals that have been announced over the last year, most of them involve the vendor taking over the services arm, including the employees and assets of the client. That's the major reason behind the size and tenure of the deals," said Hansa Iyengar, senior analyst at Ovum Research. She also said that though these were in some way similar to the large multi-year outsourcing deals of the past, the margins are not as high as before. "The vendors take on more risks in the short term," she added. In the last one year, most domestic IT biggies have announced clinching multi-billion dollar contracts from clients. Market leader Tata Consultancy Services had won more than $5 billion worth of contracts during this period, some of which have come up with rebadging of employees. For instance, the IT firm is in the process of rebadging around 2,200 employees of Transamerica Life Insurance as part of its $2 billion contract it signed to transform the administration of the company's US insurance and annuity business lines. Similarly, TCS also announced that it would rebadge around 1,800 employees of Prudential Plc as part of a $690 million contract. More recently, the country's second largest domestic IT firm Infosys has bagged a contract worth around $700 million from US telecom giant Verizon in the July-September period this year. As part of this, it will rebadge around 2,500 employees, including around 1,500 located in the US. 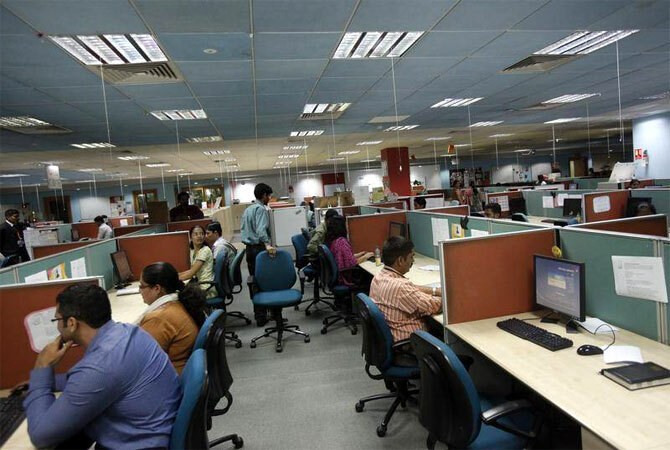 Similarly, another IT biggie Wipro is in the process of absorbing around 9,000 employees of US-based human resources and financial solutions company Alight's India unit into its business process outsourcing division as part of a $1.6 billion outsourcing contract. As part of the deal, Wipro had also announced that it would invest $117 million in Alight. "Enterprises are increasingly looking at cost savings in their IT outsourcing deals. That's why acquisition of a unit, rebadging and upfront investment are coming with the contracts. IT firms are unwilling to take that kind of risk without revenue assurance and are asking for multi-year contracts to make decent margins," said Pareekh Jain, managing director, India, of HfS Research. This trend has also been highlighted in a recent Gartner study which said that 46 per cent of the organisations surveyed by the research firm see IT services and supplier consolidation as one of the important cost optimisation approaches.